While flowers and trees are usually the centers of attention, flower pots and containers share much of the limelight. If they are old, discolored, broken and in disrepair, the overall appearance of the garden will be tarnished. Luckily, you can fix this problem by replacing the old flower pots and containers with new ones. 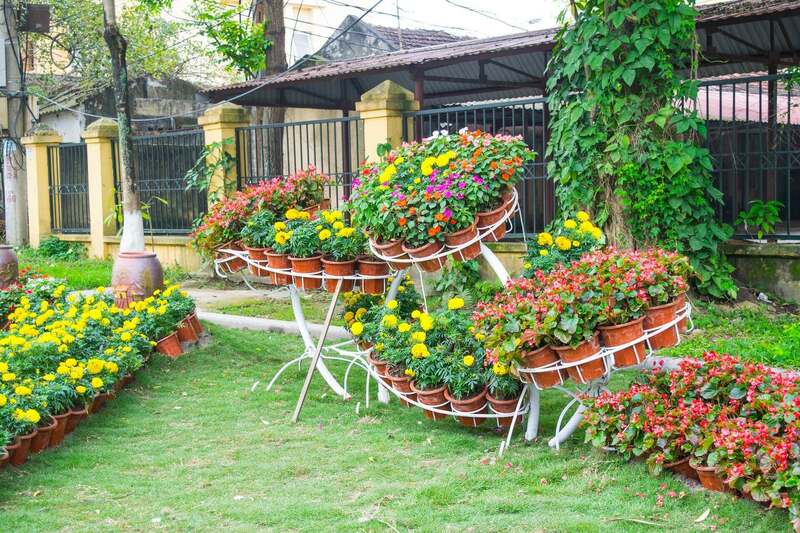 And, even if the flower pots are in perfect condition, consider replacing them with new and unusual ones. There are many unique flower pots and containers online and in your local garden store that are sure to capture the attention of your garden guests and will certainly be a huge upgrade to your garden! Consider pots and containers of different shapes and sizes and even bright colors such as teal, red and orange! Another simple idea to upgrade your garden right now is the addition of lights. While you may have been of the belief that hanging out in the garden is a daytime activity, we are here to tell you that you are wrong. Adding lights can set the tone for a romantic afternoon, highlight garden features such as a pool, fountain or stone path and can even provide security if there are dark spots in your garden. Your lighting options can range from high voltage landscape lighting which will require an electrician to do the proper wiring (which will cost a pretty penny) to some string/fairy/pepper lights running along its perimeter, around pots and across benches, to a few solar lights which are much easier to install and doesn’t require a licensed electrician. Before you say, “isn’t this supposed to be a simple upgrade?”, hang on just a bit. You don’t have to dig up your backyard to install a stone or wooden gazebo. In this case, you can upgrade your garden with a cheap steel grill gazebo, metal gazebo or a screened gazebo which you and a family member or two can install on your own. A gazebo is a great addition to any garden because it provides additional lounging space, provides shade from the sun, can be used for meals or family gatherings and you can just unwind and relax under your gazebo after a long day. Aside from flowers, your lawn is a big part of the overall appearance of your garden. Forget decorations and benches, if your lawn is unhealthy, your garden won’t look as good as it should. Tend to your lawn by watering frequently, removing weeds thatch and moss, seeding and mowing. Investing in a quality lawn mower can take your lawn from one level to the next. Raking to remove dead leaves and lawn clipping can also make your lawn look neat, tidy and attractive. While this may not seem like an upgrade to your garden, it will keep up appearances without making any drastic changes. Anything that does not need to be there, remove it. Any old, broken or discolored furniture must be removed or replaced. If the floors and walls are dirty, consider using a power hose or hiring someone with a jet washer to remove dirt and grime. You may also repaint if necessary, or change the color to something brighter, or even lighter, whatever you prefer. Did you know that high traffic on your lawn can be detrimental to its health? Yes, it is true. Reduce traffic by adding stepping stones or a path through your garden for you and your guests to walk. This not only protects the lawn and plants but is also an attractive addition which adds to the overall look and feel of your garden. There are a variety of stepping stones to choose from and they come in different shapes, sizes, patterns, and even color. And, if you are a DIY person, you’ll be happy to know that you can even make them yourself! Water features can include a pool, fountain, pond or bird/butterfly bath. If you are on a budget, a blow-up pool is a fun and easy installation method that will have your kids and even yourself occupied all summer. Fountains are classy and are a sight for sore eyes. The sound of water can also be very soothing after a long and stressful day. Adding a pond does not necessarily have to be an expensive upgrade to your garden and you can even dig one yourself with some assistance and some polyethylene liner. It doesn’t even have to be big. Just maybe a suitable size for a few water lilies, flowers some fish or even frogs and turtles. There are many inexpensive bird/butterfly baths you can choose from and you can even make one yourself! It may get chilly sometimes and if you want to enjoy your garden in the late night and afternoon hours, it is probably best you construct a fire pit. Fire pits provide both warmth and light can be constructed for under $50 with a few flat stones, cement or mortar. Huddle around the fire pit with friends and family and listen to stories and share jokes or sit nearby to enjoy an afternoon meal. You can even have a little romantic date by your fire pit or bowl with your significant other and create beautiful memories in your home garden. See? Upgrading your garden doesn’t have to take weeks of work or thousands of dollars. Upgrade your garden right now with these simple ideas for you, your friends and your family to enjoy. garden ornament is a good way to make a house unic.